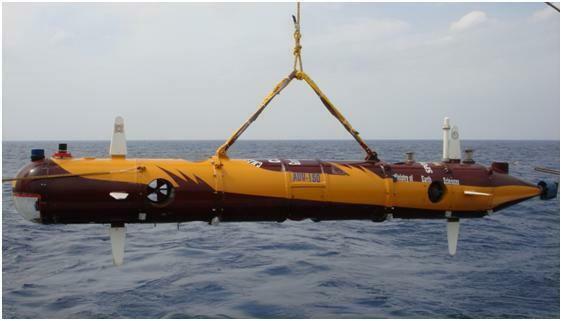 AUV-150 can be deployed for seabed mapping, coastal surveillance, mine counter measure and oceanographic measurements during adverse weather conditions. It can perform various jobs related to underwater inspection with camera, surveying etc. Modular streamline structure helps to integrate additional payloads with very less efforts with reasonably lesser drag without changing the original configuration. It is stable against roll motion making it suitable for the sea-bed mapping application in addition to relevant scientific data collection. Degrees of Freedom (DOF) have been reduced from six to five through mechanical design, thereby balancing the roll motion of the system and reducing control complexity. Design for slight positive buoyancy for better diving control and safety i.e., prevention of AUV getting lost on the sea due to any malfunctioning. Dual communication including both RF and Acoustic communication. Emergency handling with power management and leak detection subsystems. Single ground reference point (SGRP) for electrical Isolation and Grounding of the complex AUV system. Level/Scale of Development: Post processing of trial data as obtained during sea testing indicates that the performance of the developed AUV prototype is very much satisfactory.